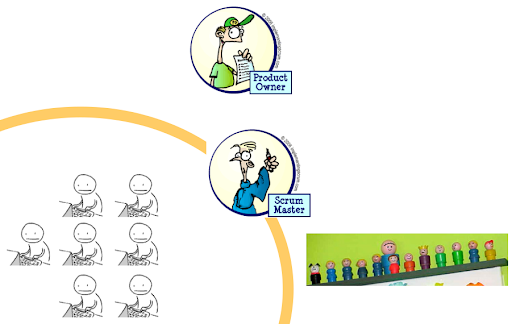 Scrum is a process skeleton which includes a set of practices and predefined roles. 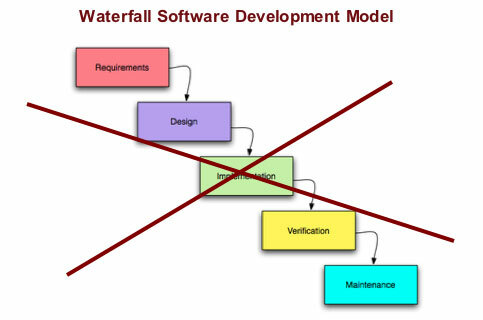 IMHO it has been inspired by other processes : XP (good practices), RUP, Waterfall (bad practices), etc… to become one of the best development processes nowaday (especially for experienced teams). Nevertheless, you may find some terminologies in Scrum funny. The “Scrum” word itself is derived from rugby game, in which it means the rugby team forms a close-knit shoulder-to-shoulder formation to jointly move the ball forward. – Primary job is to remove impediments to the ability of the team to deliver the sprint goal. – Not necessarily the leader of the team (as the team is self-organizing) but acts as a buffer between the team and any distracting influences. – Understands the benefits of the Scrum process to ensure that Scrum practices are used as intended. – Includes others in Scrum team, who have the responsibility to deliver the product. – Usually 5-9 people with cross-functional skills. There are some minor variants. However, in every variant, the Chicken suggests that the two involve themselves in a scheme involving ham (or bacon) and eggs (some suggest a breakfast, others suggest a restaurant). In reply, the Pig always notes that, for the Chicken, only a contribution is required (as a chicken can simply lay an egg and then resume normal activities), while for the Pig a “total commitment” (or total sacrifice) is needed (as in order to make ham or bacon, the pig must be slaughtered). Anyone can attend, but only the pigs (Scrum team) may speak. short (usually 5-15 minutes), since everybody who attends has to stand up (not excluding chickens) ! It should start at the same time every working day (practically 15-45 mins after start working time) . near the collaboration space, i.e. near the Scrum board enough to see the characters there. 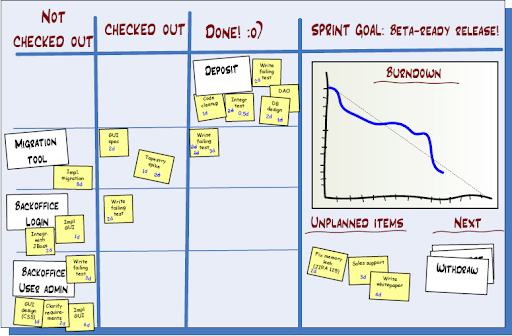 + Some of Product Backlog (user stories) will be chosen to be Sprint Backlog. + Business value of the Backlog is set by the Product Owner (client representative). That number represents PRIORITY: how Important the story is to the client. + Development effort of the Backlog is set by the Team. 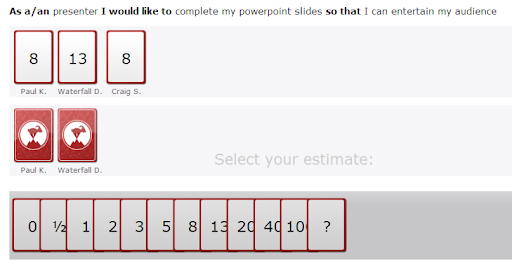 That number represents COMPLEXITY: how Hard to implement the story according to the average developer’s experience. + In this session, the Scrum team is divided into small groups (1-3 members per group). Each user story is broken down into concrete tasks, and for each task every group “votes” a number as “the estimated points” for the task. + Cards with number are usually used for displaying the “voted/estimated” points (Poker style, but Fibonacci-like numbers). One task point is implicitly considered 1 man hour, for simplicity. 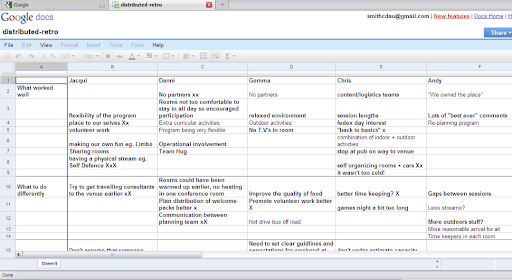 (note: non-Scrum Agile methodologies, such as XP, may use 1 man day for 1 story point). + If the points from the groups for the task are unanimous, or similarly (highest number is not higher than 1.5 the lowest number), the “final estimated points” is determined and marked into the task. + Total estimated points for a story should not exceed a predefined certain amount (20-40 man hours), otherwise the story may either be labeled as “technical story” or be broken into smaller stories to not violate that limitation. + Burn chart is a graphical representation of work left to do versus time. Burn-down chart is always better than burn-up chart. 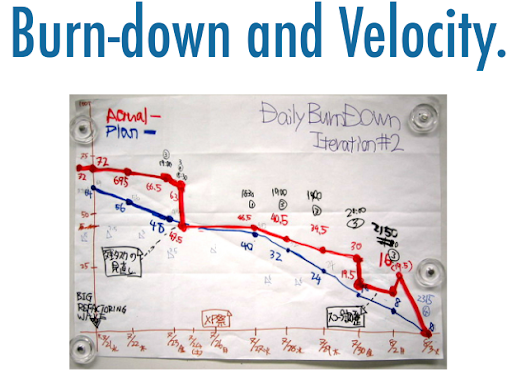 + Burndown chart is not only useful for keeping track of the team’s progress, but it’s also effective for predicting when all of the work will be completed. + Over a number of sprints you will see how many story points the team can earn – the velocity. It helps to predict delivery times based on number of story points outstanding. + what could have been improved? + which improvement should be applied right next Sprint? 1/ Is Scrum that simple? I’ve worked with processes that are 10x more complex ! + Yes, it’s simple enough to get acquainted and get started. But after applying Scrum for a while you may understand why it’s worth a KISS in software industry. 2/ Why is burn-down chart better than burn-up one ? + Because it is much more emotional powerful. The target is visually closer day by day, so the confidence that the team would actually meet the schedule increases dramatically. And the special feeling about hitting the number zero that helps people get excited about completing their work and pressing forward. 3/ What is the best tool for Scrum?